There’s a new kid on the block named Pinterest. This new platform is all the rave these days and for good reasons. Since May 2011, traffic to Pinterest has increased by 2,702% and counting. Not to mention that Pinterest has become top traffic driver for retailers. So what does all of this mean for your brand’s PR strategy? A well executed PR strategy crafts compelling messages for a brand. Similarly, Pinterest is all about storytelling, which makes it a very effective tool for a digital PR strategy. Unlike Facebook, Twitter, and the other platforms, Pinterest is less promotional and more about connecting audiences with the brand’s lifestyle through photos and visual content. So if your brand is visual or can convey its messages and lifestyle through imagery, then Pinterest should be added as another tool to engage and communicate with your audience. However, there is a huge BUT about Pinterest, and brands should take notice. 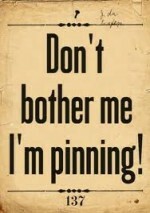 Nearly 90% of Pinners (users who pin on Pinterest boards) are women, leaving out an entire demographic of men. One thing Pinterest forces brands to do is to visualize their story. Instead of words, define your brand and the lifestyle it promotes so that your audience becomes so interconnected with your brand. For example, if the brand is a hotel, pin photos that target various interests like destination guides and local attractions. In addition to a news release, consider posting images that communicate the topic or content within the news release. Videos can be used to extend the story. Visualize news or developments happening within your industry. Encourage your audience to contribute to your brand’s board and engage them like you would any other social media platform. Pinterest is huge for driving traffic and has high SEO ranking. So be sure to add descriptive tags to images. The infographic below sums up how Pinterest helps brands engage audiences more intimately and drive greater value.